“The blood orange is a variety of orange (Citrus sinensis) with crimson, blood-coloured flesh. The fruit ranges from small- to medium-sized; its skin can be pitted or smooth. Blood oranges owe their distinctive appearance to a pigment called anthocyanin not typically found in citrus, but common in other red fruits and flowers. Not only is the inside of the orange darkly pigmented, but depending on the variety, the outside may feature dark washes of red. The exact reasons for the unusual inside colour are unknown. However, it seems that light, temperature and variety are important contributors. I am sad that the blood orange season is ending. So I decided to make one more dessert this season to celebrate this lovely orange. I fell in love with this orange a few years ago because of its juicy, sweet and less acidic interior, as well as its amazingly beautiful colour. But really it is the taste that I have grown fond of, and I think that it is a wonderful orange for desserts. The dessert that I have composed is built around Martha’s blood orange gelato. 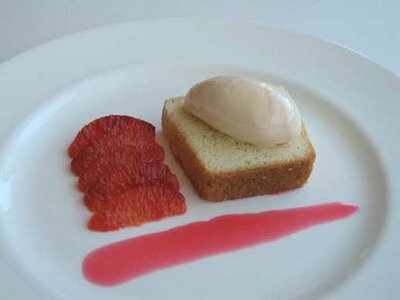 The gelato sits on a pound cake, which includes blood orange zest, and is accompanied by segments of orange and a blood orange jelly. The flavours blended easily to create a casual and comforting ode to the blood orange. In a medium saucepan, combine milk and orange zest. Bring to a gentle boil, cover, and remove pan from heat. Let steep 30 minutes. In a small saucepan, cook orange juice over medium-low heat until reduced by three-fourths, 30-40 minutes. Remove pan from heat, and let orange syrup cool completely. Combine egg yolks and sugar in the bowl of an electric mixer fitted with the paddle attachment. Cream at medium-high speed until very thick and pale yellow, 3-5 minutes. Return milk to a simmer. Add half of the warm milk to egg-yolk mixture; whisk until blended. Return new mixture to saucepan. Cook over low heat, stirring constantly, until thick enough to coat back of a wooden spoon. Have ready an ice-water bath. Remove saucepan from heat; immediately stir in cream. Pass mixture through a sieve set over a medium bowl. Place bowl in ice-water bath; chill. Stir in orange syrup. Freeze in ice-cream maker according to manufacturer’s instructions. Store in an airtight container. Posted by Sam at 5:23 p.m. Your chocolate mousse post, while wonderful, is eclipsed by this one. I am a fool for citrus, and this looks astonishingly good. I appreciate the information about blood oranges ... I don't know why but I assumed there was only one kind. As always thanks for your comment Tania. I also didn't know that there were three different varieties until I did some research. I think blood oranges are my favourite oranges at the moment. Normally I would say yes to the insane idea of making the dessert three times over, but since they are going out of season, I think we will be hard pressed to find some good blood oranges.